Though we’ve known of Vega 20 for some time with the launch of server-class Radeon Instinct MI50 and MI60, its arrival to the consumer space does mark the first 7nm gaming card. Rapidly moving down to a lower node – this time from GlobalFoundries 14nm LPP to TSMC 7nm (CLN7FF) – used to be an AMD/ATi hallmark, and once again AMD is pushing the envelope by bringing it so early to consumers. That being the case, all the attributes of Vega 20 look squarely to be for the professional/server crowd, though not devoid of benefits for gaming. Of the many threads in the Radeon VII story, the fate of Vega as a whole has been nothing short of enigmatic. To start things off, the 7nm Vega 20 GPU making its way to consumers was a surprise to most, at least arriving this early. 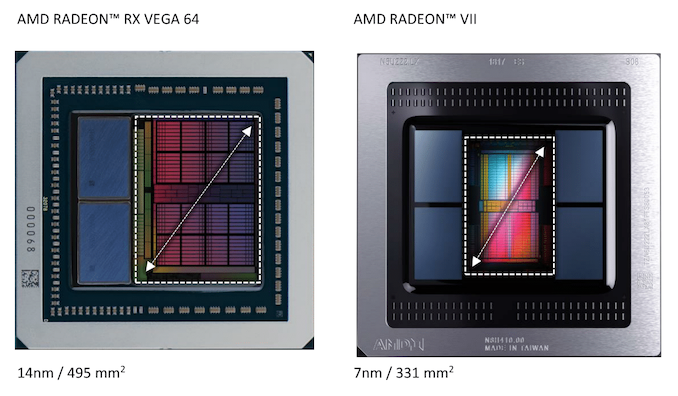 And while AMD only made mention of Vega 20 in reference to Radeon Instinct products – referring to the forthcoming Navi when speaking about 7nm GPUs for gamers – AMD now maintains that the plan was always to bring Radeon VII to market. Perhaps the same might have been said regarding Vega on 14nm+/12LP and the Vega 11 GPU (not to be confused with Ryzen 2400G’s 11 Vega compute units), though to be clear this is hardly unusual given the nature of semiconductor development. To be fair, AMD has only been coy at best about Vega since the RX Vega launch, which didn’t quite land where AMD wanted it to. But even as a bit of Schrodinger’s silicon, the existence of Radeon VII does raise some interesting questions about 7nm. For one, AMD had already moved up their Vega 20 sampling and launch windows previously. So Radeon VII’s launch timing is realistically the earliest it could be for a consumer derivative of the Radeon Instinct. Even more so is that with a die size of 331mm2, these aren’t small mobile SoCs or comparable ‘pipecleaner’ silicon that we’ve seen so far on TSMC 7nm. Designed with compute/ML-oriented enhancements, equipped with 4 HBM2 stacks, and fabbed on a maturing and cutting-edge 7nm node, Vega 20 has nothing on paper to push for its viability at consumer prices. And yet thanks to a fortunate confluence of factors, here we are. At a high level. Vega 20 combines an updated GCN 5 architecture with a 7nm process, coming out to 13.2B transistors on 331mm2 (versus 12.5B transistors on 496mm2 for Vega 10). Typically with die shrinks, these space-savings are often reinvested into more transistors – for a gaming card, that can mean anything from more CUs and functional blocks, to layout redesigns and hardened data paths for improved frequency tolerance. The latter, of course, is to enable higher clockspeeds, and this design choice was a big part of Vega 10, where a significant number of transistors were invested to meeting the requisite timing targets. In conjunction with power-savings of a smaller node, a chip can then get to those higher clocks without additional power. For Vega 20 however, much of the saved space was left simply as that: more space. There’s several reasons of this, some obvious, and some less so. To start things off, as a relatively large high-performance GPU on a leading-edge 7nm node early in its life, development and production is already costly and likely lower-yielding, where going any larger would cost substantially more and yield less. And though TSMC’s 7nm process has only publicly been seen in mobile SoCs thus far, Vega 20 presumably makes good use of the HPC-oriented 7.5T libraries as needed, as opposed to using the 6T libraries intended for mobile SoCs. But more importantly, the saved space allows room for two more stacks of HBM2 on a similarly-sized interposer. 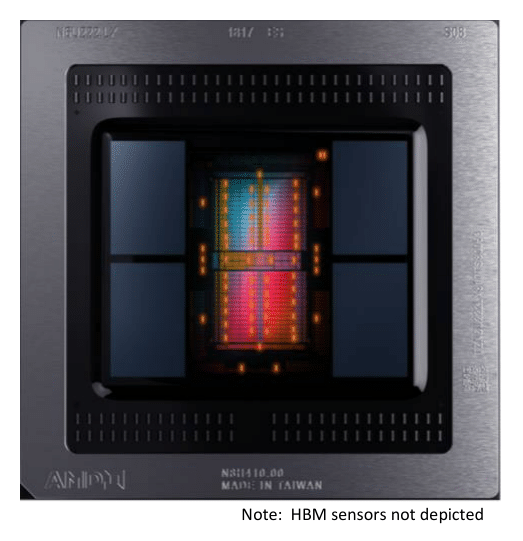 For current-generation HBM2 densities and capabilities, the limit for a two stack chip is 16GB of memory, using a pair of "8-Hi" stacks. But for a server-grade GPU – especially one targeting machine learning – a four stack configuration needed to happen in order to allow for 32GB of memory and a wider 4096-bit bus. For Vega 20, AMD has delivered on just this, and furthermore is producing both 32GB (8-Hi) and 16GB (4-Hi) versions of the chip. Radeon VII, in turn, is tapping one of these 16GB chips for its core design. It should be noted that this isn't AMD's first 16GB Vega card – they also produced one early on with their early-adopted focused Vega Frontier Edition card – but since the Frontier Edition's retirement, this is the first (re)introduction of a 16GB card to AMD's Vega lineup. Going with a 16GB for a consumer(ish) card is a bit of a gamble for AMD. And, I suspect, this is part of the reason we're also seeing AMD chase part of the professional visualization market with the Radeon VII. When it comes to workstation use and content creation tasks, more VRAM is an easy sell, as there are already datasets that can use all of that VRAM and more. But for gaming this is a harder sell, as games have more fixed VRAM requirements, and absent such a large card until now, developers haven't yet started targeting 16GB cards. On the flip side, however, the statement "this card has more than enough VRAM" has proven to be famous last words, and in 2019 a flagship enthusiast-grade gaming card ought to have that much anyway. Getting back to Vega 20's design then, the other step AMD has taken to reduce the complications and cost of 7nm is by sticking to a die-shrink of a known architecture. Here AMD has added optimizations over Vega 10, but they did not risk a large redesign. Basically it's the logic behind the ‘tick’ of Intel’s old ‘tick-tock’ strategy. In fact Vega 20 is such a straightforward shrink of Vega 10 in this manner that, outside of the number of memory controllers, all of the other functional unit counts at the same. 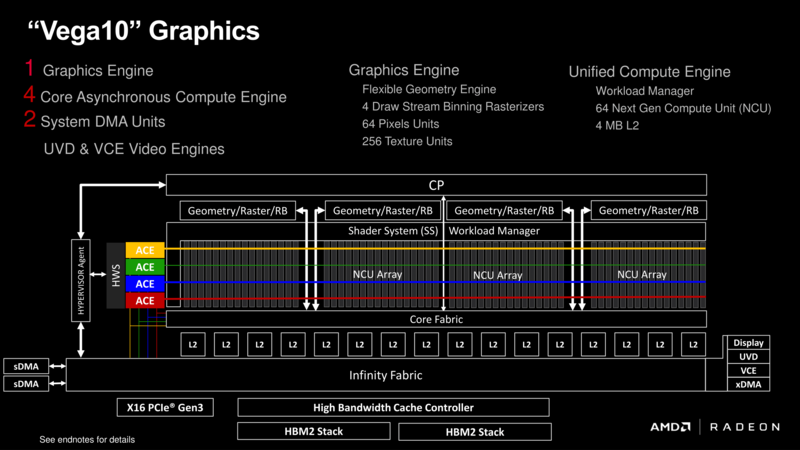 The GPU packs 64 CUs and 256 texture units segmented into 4 Shader Engines, which in turn are paired with 64 ROPs and AMD's multi-queue command processor. So on an architectural level, Vega 20 is very much an evolutionary design. But with that said, there is a bit more evolution to it than just the die-shrink, the combination of which means that Vega 20 should in practice be a bit faster than Vega 10 on a clock-for-clock basis. The big improvement here is all of that extra memory bandwidth; there's now over twice as much bandwidth per ROP, texture unit, and ALU as there was on Vega 10. The bodes particularly well for the ROPs, which have traditionally always been big bandwidth consumers. 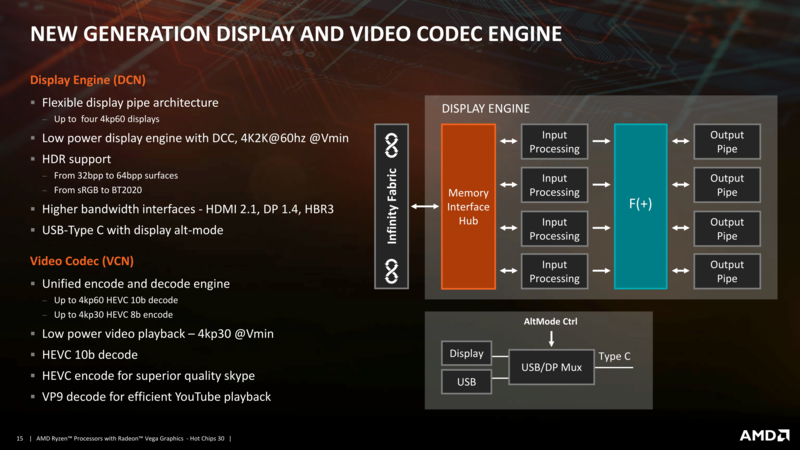 Not stopping there, AMD has also made some improvements to the Core Fabric, which is what connects the memory to the ROPs (among other things). Unfortunately AMD isn't willing to divulge just what these improvements are, but they have confirmed that there aren't any cache changes among them. Another piece of the puzzle is that AMD has added some new instructions and data types that will speed up machine learning in certain cases. AMD hasn't given us the complete details here, but at a high level we know that they've added support for INT8 and INT4 data types, which are useful for some low-precision inference scenarios. AMD has also added a new FP16 dot product that accumulates as an FP32 result, a rather specific scenario that is helpful for some machine learning algorithms, as it produces a higher precision result than a FP16-in/FP16-out dot product. 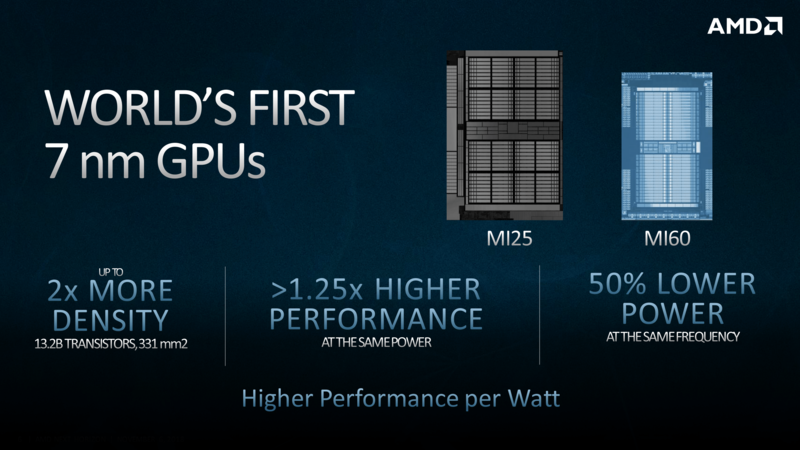 Speaking of data types, AMD has also significantly ramped up their FP64 performance for Vega 20. As a core architecture, GCN allows a GPU to be built with a rate ranging from 1/2 to 1/16 the FP32 rate. For pure consumer GPUs this has always been 1/16, however for GPUs that have pulled double-duty as server-focused chips, they have enabled 1/4 and 1/2 rates in the past. Vega 20, in turn, is the first 1/2 rate FP64 GPU from AMD since Hawaii in 2013. This means that while its general FP32 performance gains over Vega 10 cards are somewhat limited, its FP64 gains are nothing short of massive – better than 8x over the RX Vega 64, on paper. Of course as a consumer card the Radeon VII doesn't quite get to enjoy these benefits – it's limited to 1/4 rate – but more on that later. Meanwhile, for AMD's video and display controller blocks, there have only been minor, incremental updates. Officially, the display controller (DCE) is up to version 12.1, while we're on unified video decoder (UVD) 7.2, and video coding engine (VCE) 4.1. No additional encoding or decoding feature support have been added compared to Vega 10. For what it’s worth, we’ve already seen the successor blocks with Raven Ridge’s Display Core Next and Video Core Next 1.0, so this may be the last architecture that those ASICs grace us with their presence. Wrapping up the functional blocks is a new style of SMU, discussed in recent Linux kernel patches. Orthogonal, but closely related, is improved thermal monitoring, where the number of temperature diodes has been doubled to 64 sensors. As a consequence, AMD is now fully utilizing junction temperature monitoring instead of edge temperature monitoring. Junction temperature measurements were used in Vega 10 (showing up as ‘hotspot’ temperature) but Vega 20 has made the full jump to junction temperature for the full suite of fanspeeds, clockspeeds, and such. The result is more accurate reporting, as well as minor 1-2% performance gains (via reduced throttling) that AMD cites from internal testing. The updated SMU also brings with it a knock-on effect: temperature, clockspeed, and related GPU metrics are no longer read through registers, but instead grabbed straight from the SMU. Naturally, this breaks compatibility with third-party utilities (i.e. GPU-Z), and while AMD has already notified some developers of these changes, applications will still need to be updated to use AMD's new API calls. 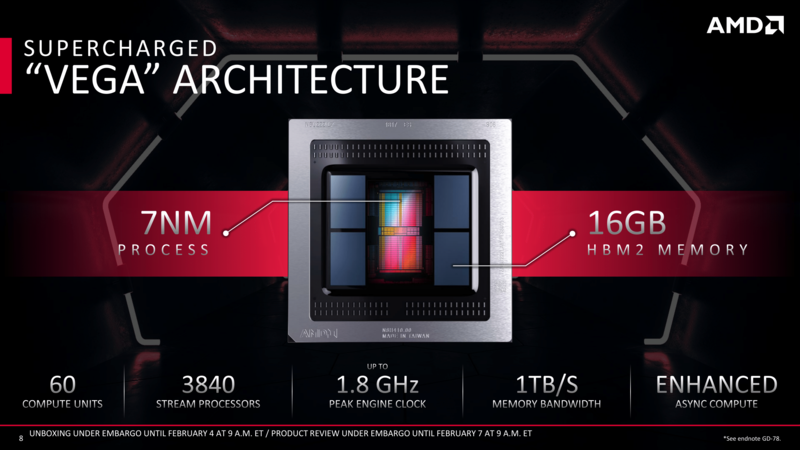 Finally, as this is AMD's first new high-end Vega silicon since the original Vega 10 in 2017, there have been a few questions swirling around Vega’s forward-looking hardware features. AMD's communication hasn't always been clear here, and as a result these features have become sort of a perpetual source of consumer confusion. To settle matters for Vega 20 then, AMD doesn’t seem to be changing the situation here. 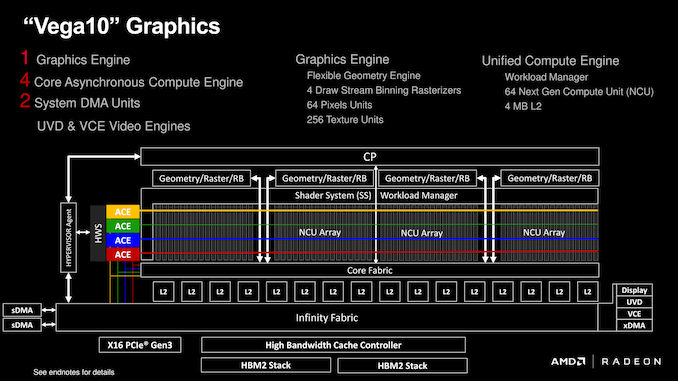 Which is to say that there have been no further developments as far as AMD's primitive shaders are concerned. 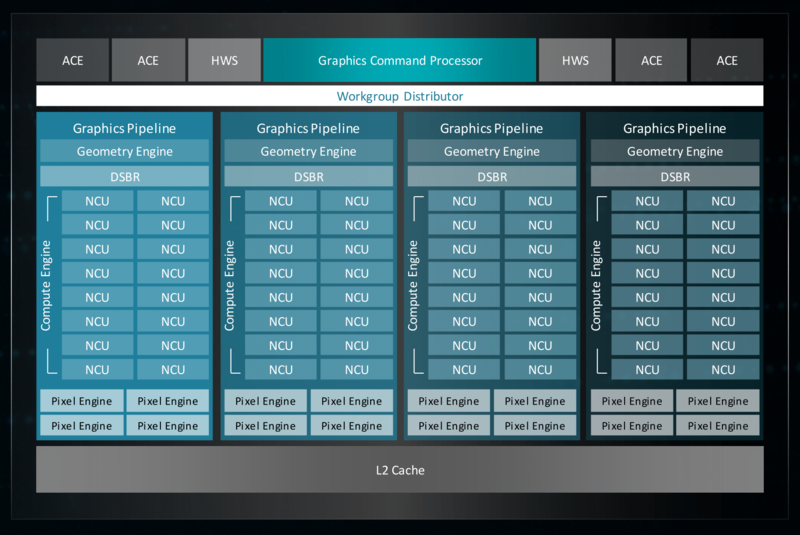 Primitive shaders will still require explicit developer support – something AMD has not enabled – and so the full capabilities of Vega 20's Next-Gen Geometry path aren't being utilized (though we should note that the Intelligent Workgroup Distributor portion has always been enabled). Meanwhile, AMD's Draw Stream Binning Rasterizer (DSBR) was already up and working in Vega 10, so this hasn't changed; the feature is enabled for an unspecified list of games. And checking in quickly on Rapid Packed Math (fast FP16), this is in use for two known games: Far Cry 5 and Wolfenstein II.